Hello Friends! It's time to play a game. 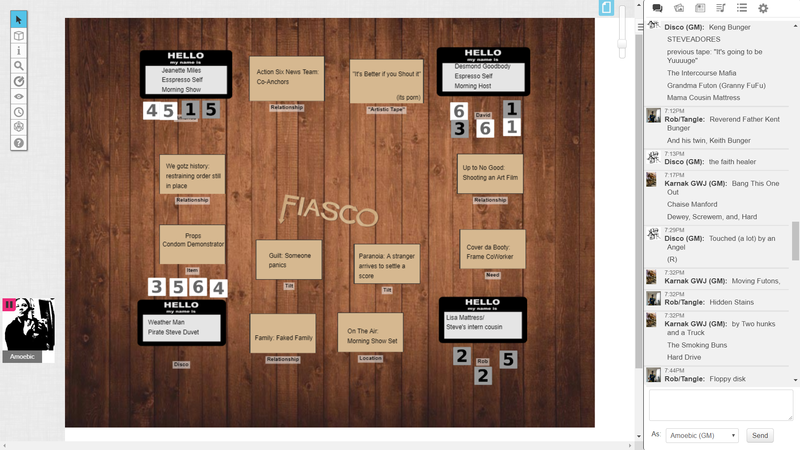 Over the years, a few of us have gathered to play the popular Tabletop RPG Fiasco on Roll20! Now that some practice has been hammered out, I've decided to settle on some hard rules for the games I host to make things going forward a little smoother. If two cancel, the session for the day is canceled. (Typical attendance rules for many tabletop groups). Due to the nature of the game and the level of commitment required, I organize these sessions via signups. Since these can take 2-3 hours, I don't want to waste time dallying around to see if someone else might show up before we finally decide to get started. Please allow yourselves the time to play for the full 2.5 hours allotted. If you're not sure that day, there will always be other days! Players leaving part-way through can disrupt the flow and narrative of the game, please be mindful of that. We lowered the player count for faster sessions so as not to demand too much of your time. However, if we're already 3-manning and someone has to bail, the game will need to end immediately, so do keep that in mind. This is a GM-less game. However, due to how Roll20 operates, I'm the GM only in the sense that I'm in charge of some of the structure and movement of pieces. Since I'm in charge of turning the gears, it's a little much for me to hunt down and find the playsets every week, which would also get a bit homogeneous. I prefer variety and I hope you do, too! If we don't pick your's that week, bank it for a future date on the signup spreadsheet. I strongly suggest picking up a physical copy of the rulebook to have on hand, as the Playset and the game board will be digital already, consuming much of your desktop real estate. Many players have the playset downloaded to their phone. Things can get wild, crazy, and silly. I hope they do! -conduct yourself with the level of respect we ask of our forum members. Racist, sexist, homophobic, transphobic, hateful, bigoted, or explicitly pornographic language or content will not be tolerated and may get you kicked from the sessions. Try to be clever enough to be coy. If it breaks the ToS for GWJ, Roll20, or Twitch in any way, expect it not to be tolerated at the table. We're all adults here, and I won't be needing to warn you more than once should it happen mid-game. -"Yes, and..." Fiasco is an improvisational collaborative storytelling game involving all players. Search for "Yes, and..." in regards to improv to get up to speed if you're unfamiliar with the concept so you come to the table open and willing to try what's handed to you. I'd like to start streaming these sessions to the GWJ channel in the coming months! In the meantime, I'll stream to my personal channel while we smooth things out. Will there be the opportunity to spectate on some of these? Spectating: YES. After some practice rounds, I'll start streaming them to the GWJ channel. I'm stiff and my memory is poor, so after we get back into it again we will look at sharing. If everyone at the table is ok with it I'll stream to my own channel for now? *would be interesting to watch it played though if any streams are saved for watching later? I’m in! After the first session, I’ll try to recreate the guide vid I did last time with the tightened rules. I'd love to try this some time, but 5 PM PST is rough for me (I'm on Eastern, so it's definitely not as rough as it would be for pyxistyx). I'll probably check out some of the streams, and may try to join in the future. Do we have a play set chosen for tomorrow? Same some time to alreadybhave it pulled up on screen when we start. Do we have a play set chosen for tomorrow? Same some time to already have it pulled up on screen when we start. Oooo, that sounds like fun. I’m down for it. Wheee! New Thread who dis? My face hurts from laughing, thank you so much! I loved this so much, I'm so glad I was able to play this game with such amazing people. Thank you Tanglebones, Discoursian, and Karnak. 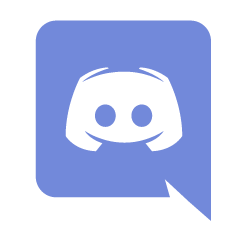 The chat accompanying a voice channel is always a fresh mess, and this is exceptional. I am sorry I didn't try to listen in, and missed it. I can't wait to watch this on the GWJ stream! Looking forward to seeing/hearing it on the streams next time, intrigued and enjoyed the monster prom during the charity stream hugely. Glad to hear it went well. Oh no. I'm so sorry. I didn't record it. 100% on me. We talked about it, but I think once the ball started rolling it felt like cutting in half way wouldn't make much sense. I would have had to stop the game to set it up to properly record just the audio. Could not get video to work. Hoping an Nvidia update and restart resolves this. This is what these dry runs are about, ironing out kinks before going live. Don't worry, we'll be sure to warm up slowly and use more lube next time! Tagging. I so want to join. Just need to find a day that works with the schedule. This sounds awesome. Room for two more next Tuesday the 12th! Postponing this week. Please join us next week the 19th! Sorry about this week =C. Should be good for next week because... Spring Break! Wooooo.... god I'm so old. I'm so glad you brought this back. I'm excited to play, but I hope no one minds that I only played one game about 5 years ago. If that's just going to slow things down too much, let me know.